Rebecca Halstead began supporting the idea of utilizing alternative medical treatments, such as chiropractic care and nutritional supplements, after being diagnosed in the year 2005 with fibromyalgia, a condition distinguished by widespread musculoskeletal pain along with fatigue, sleep, memory, and mood issues. 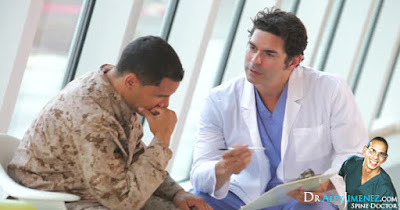 However, throughout the time the retired Army brigadier general discovered her own solutions for the chronic symptoms of her condition, she was amazed by the recent studies indicating the troop’s use of alternative medical therapies at much higher rates than their civilian counterparts. Rebecca Halstead became curious about the way troops recognized the availability of these benefits. “How do they find out about it and pay for it? It was not a high priority when I was in the military”, she quoted, acknowledging complementary and alternative medicine, or CAM. A new research in the Journal of Alternative and Complementary Medicine revealed that active-duty members utilize several alternative therapies for stress management up to seven times higher than civilians. The study also noted that among both troops and civilians, the most common complementary medical therapy was prayer. Although, troops also resort to massage therapy, meditation, and guided imagery therapy, a treatment that focuses on positive and soothing mental images to promote relaxation, at higher rates than their civilian counterparts, according to the study. For the researchers, the reasons still remain unclear. Christine Goertz, the lead study author and vice chancellor of research and health policy at Palmer College believed individuals in the military may possess a greater motivation for achieving high levels of fitness or they may be involved in situations of high stress that could be influencing these elevated rates of CAM use. Goertz also mentioned in her statement how troops also show higher rates of musculoskeletal injuries, which can be treated with chiropractic. A combination of many possible factors could be the reason behind the results of the study. The Army-backed study needed to understand whether further research was required to determine the cause for use of alternative therapies among troops, especially because the therapies are considered to be widely understudies, even though troops are using a wide range of them. According to the study, more than 55 percent of individuals reported using CAM in the former year, including prayer. Not including prayer, 44 percent of troops reported using CAM while 36 percent of civilians reported the use of nontraditional medical treatments. Of the therapies listed within the survey, one is offered frequently through the military health system, chiropractic care, and it is available at about half of the military treatment facilities. Troops may be more involved in these different types of therapies because they are often managed outside traditional mental health clinics or carried out by civilian practitioners not involved in military health care. This indicates that service members may turn to CAM to sidestep the stigma associated with mental health care, retired Col. Elspeth Ritchie, a former Army psychiatrist wrote in the journal Psychiatric Annals. Rebecca Halstead was greatly encouraged by the end results of the study. Back when she was diagnosed, Halstead received various prescriptions for pain, including two antidepressants. “I believed the doctor had made a mistake because I wasn’t depressed. He said, ‘Maybe not now, but you will be.’”, she stated. After seeing a chiropractor and following a strict diet including whole food supplements, Halstead has not taken any prescription medications. CAM may not be well-researched and many individuals claim its expensive to use, but people could pay a much higher price if their bodies are not properly healed after suffering an injury or condition, during service and everyday life alike.